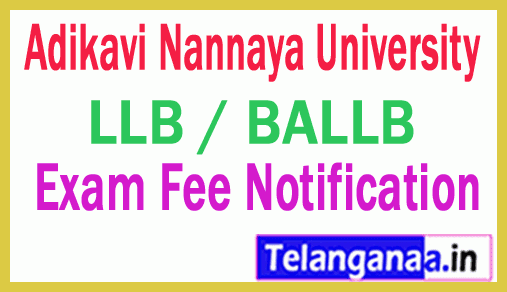 AdiKavi Nannaya University LLB(3Y) / BALLB(5Y) 3rd Sem Reg / Backlog Fee Notification 2018: Adi Kavi Nannaya University has announced that the LLB / BALLB 3rd semester fee notification on their official website at aknu.edu.in. A large number of candidates will participate in the 3rd Sem Reg / Backlog examination. So the students are waiting for the fee notification it is available on the bottom of this site. Adi Kavi Nannaya University has announced that the second semester and the fourth semester of the LLB/BALLB, which were held on Dec 2018, and the Form of the examination application to be kept in Adi Kavi Nannaya official website each candidate Shold will pay the additional examination fee of 55 / - per candidate in the direction of registration fee with the usual examination fee and forwarded by concerned college headmaster.